A Nazi German and Soviet Communist officer shake hands after their successful invasion of Poland in September 1939. The Molotov-Ribbentrop pact (formally the Treaty of Non-aggression between Germany and the Union of Soviet Socialist Republics, also called the Hitler-Stalin pact, Nazi-Soviet pact and Communazi pact) was a treaty between Nazi Germany and the Soviet Union, in the opening days of World War II. Some portions of the Molotov-Ribbentrop pact remained in force until the collapse of the Soviet Union in 1991. While Moscow had been negotiating this treaty with Berlin, the Soviets were fighting a major campaign against Hitler's ally Japan. Stalin feared a two-front war against Germany and Japan. Representing the Soviets was foreign minister Vyacheslav Molotov, and representing the Nazis was foreign minister Joachim von Ribbentrop. The treaty was signed on August 23, 1939, three days after the start of the Battle of Khalkhin-Gol between the Soviet Union and Japan. In mid-September, Tokyo signed a non-aggression pact with Moscow. After the Eastern border was secure Stalin then invaded Poland on 17 September 1939. 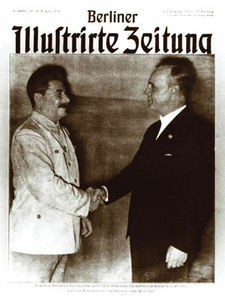 The signing of the Communazi Peace Pact marked the end of the Popular Front era. The alliance of Japan with the Axis powers was a bombshell to their opponents. Senator Gerald Nye declared the Administration "policy has succeeded in driving Japan into the arms of those who were the last ones we wanted her to associate with." Japan claimed it was due to the blundering of the U.S. State Department. "'We knew it all the time' was the refrain of the statement the Secretary of State gave the press, a statement which managed to achieve prolixity though but three sentences long. . . . It is impossible to take these words at their face value without passing a harsh verdict on our diplomats . . . . It is more charitable to assume that Secretary Hull's statement was a bold front on a diplomatic defeat." With the making of the Hitler-Stalin pact, the Soviet Union was at war on the side of Germany. The Chinese Communists (CCP) stopped fighting the Japanese in the ongoing Second Sino-Japanese War, and resumed guerrilla operations against the Chinese National Government (KMT). The CCP devoted their energies to fighting the Chinese government for the portions of eastern China between the railroad lines, held by the Japanese. Nazi-Soviet Relations 1939-1941 : Documents from the Archives of The German Foreign Office. Edited by Raymond James Sontag and James Stuart Beddie. United States Department of State. Publication 3023. U. S. Government Printing Office. 1948. ↑ Jerrold and Leona Schecter, Sacred Secrets: How Soviet Intelligence Operations Changed American History, Washington, DC: Brassey’s, 2002, pg. 12. Big Four (1940), Time magazine, December 23, 1946. This page was last modified on 10 April 2019, at 18:06. This page has been accessed 38,018 times.